While at HSN for #HSNCooks, Curtis Stone graciously sent his live audience home with an autographed copy of his new cookbook, Curtis Stone Whats For Dinner, delicious recipes for a busy life. When I had a chance to go through the book, I started flagging away. I strongly suggest this to anyone who likes trying new recipes. Instead of making one dish, I made two dishes the first time cooking out of this cookbook. Both were very impressive and will be made again. 1. To marinate the steak: In a large baking dish, whisk the cilantro, brown sugar, canola oil, soy sauce, sesame oil, garlic, jalapeños, black pepper, and coriander to blend well. Reserve 1/4 cup of the mixture in a small bowl for serving. Place the steak in the remaining marinade and turn to coat. Marinate for at least 20 minutes at room temperature, or cover and refrigerate for up to 1 day, turning occasionally. Cover and refrigerate the reserved marinade. 2. Prepare an outdoor grill for medium-high cooking over direct heat. 3. Remove the steak from the marinade (discard the marinade) and grill, turn- ing halfway through cooking, for a total of about 10 minutes, until the meat feels only slightly resilient when pressed with a fingertip for medium-rare (see Kitchen Note, page 140). Transfer the steak to a cutting board and let stand for 5 to 10 minutes. 4. Meanwhile, Prepare the tacos: In a large bowl, toss the cabbage, carrots, scal- lions, and cilantro together. 5. Heat the tortillas on the grill, turning occasionally, for about 1 minute, or until hot. Transfer to a serving bowl and cover to keep warm. 6. Cut the steak across the grain into 1/4-inch-thick slices. Transfer the steak slices and any carving juices to a platter. Serve the steak with the reserved marinade, tortillas, cabbage mixture, and guacamole. 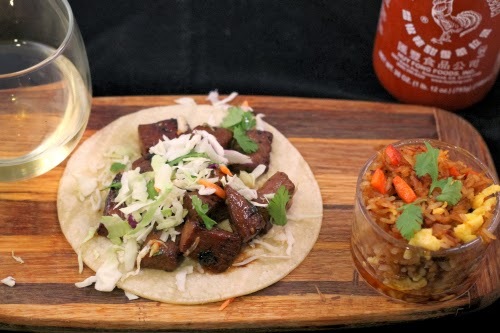 Let each guest fill two tortillas with some steak and cabbage mixture and top with some of the marinade. 1. Cut the dark green tops of the scallions on the diagonal into 1-Inch pieces. Finely chop the white and pale green parts. Reserve one-fourth of the dark green scallion tops for garnish. 2. Heat a wok or large skillet over medium-high heat. Add 2 tablespoons of the canola oil and tilt to coat the cooking surface. Add the eggs and quickly stir for about 30 seconds, or until just cooked but still wet. Transfer to a plate. 3. Add the remaining 1/4 cup canola oil to the pan. Once the oil is hot, add the rice and cook, allowing the rice to become slightly crisp on the bottom of the wok before stirring, for about 4 minutes, or until heated through. Add the carrots and stir for about 1 minute, or until beginning to soften. Stir in the kimchi, followed by the scallions (both tops and bottoms), and stir for about 2 minutes, or until heated through. Add the soy sauce and sesame oil and stir for about 1 minute. Stir in the eggs and season to taste with salt. 4. Transfer the rice to a large serving bowl. Sprinkle with the sesame seeds. Serve hot, with the hot sauce. 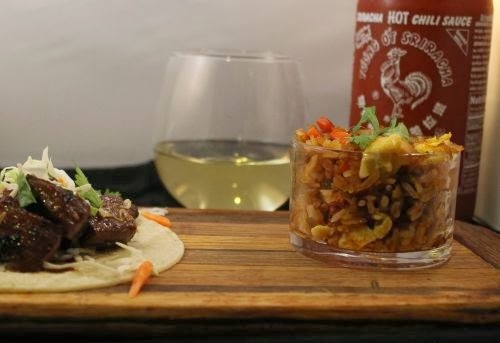 I served these two dishes with a bottle of Brancott Estate Flight Song Pinot Grigio. This grapes in this Pinto Griogio are harvested earlier than usual, leaving it full bodied but with 20% less calories. Yes please! 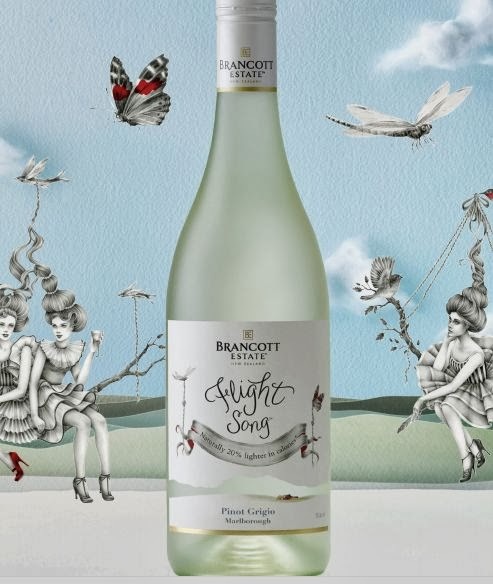 Brancott Estate Flight Song Pinot Grigio has sweet fruit aromatics from guava to melon with a palate of golden delicious apple. Of all the low calorie wines I have tasted, this was by far my favorite one. These tacos sound (and look) SO good! Also love how simple the recipe is. And I'm with you on the excellent organization of the cookbook. Too bad he didn't give you an extra book to give to a friend ;) Might actually have to buy this one! His cookbook is so amazing. I flagged everything I want to make too, LOL. Which is about 1,000,000,000 flags (or so it seems). His cookbook is everything that I want in a cookbook- tons of flavorful, time-saving meals that can be broken down by day of the week. Sounds like I need to add a new cookbook to my shelves!